A point, a point! 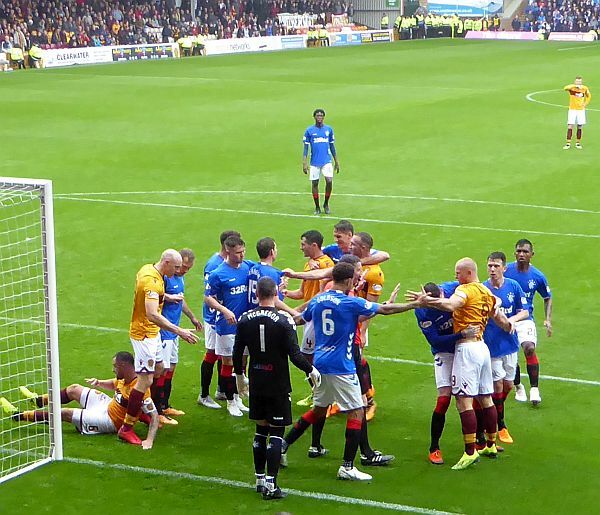 Motherwell may still be winless in the league but we at least got on the board with a deserved draw against Rangers on Sunday - even if we had to wait until deep into injury time to secure it. Peter Hartley put a week to forget behind him with his last-gasp equaliser but overall we can look back on an impressive team performance. Play like that every week and we won't be relegated. Unfortunately, if the defence and normally reliable goalkeeper Trevor Carson play like that every week we will not be very high up the table either. That is work for this week ahead of a crucial match at bottom team Dundee. We owned them last season but can take nothing for granted this term with passions and nerves both certain to be high. Still, we have two of the back three to thank for the second and third goals against Rangers and their contribution to our attack at set pieces is going to be an important aspect of our expected journey up the table. Gael Bigirimana’s obvious delight as he celebrated the 94th minute goal was well earned. His ability to deliver tempting balls into the danger area whether from free kicks or corners is invaluable. He can claim two assists to add to his steady play in the middle of the park. A win at Dens Park will give us some much needed breathing room into the international break.